I have a huge heart for storage in my home from large storage to mini storage there is always a place for more when I am decorating. I recently revamped my living room (room tour to follow) and I have been looking for some last minute finishing touches in it. Something I am always short of with two little ones is mini storage ideas. Whether its for the kids clothes or just their toys these light grey hampers are a perfect solution to hide those pesky robots, cars and dolls out of plain sight and easy for the kids to find when they want to play. I absolutely adore this wire basket and have already ordered it for my living room, I will be using mine for my latest reading material. Love this white wooden shelving independent shelving unit. I could think of a few places that it would go in my home decor. The white bail was a favorite, I love put loose flowers or for upcoming holiday decorating fill it with colorful Christmas bobbles. 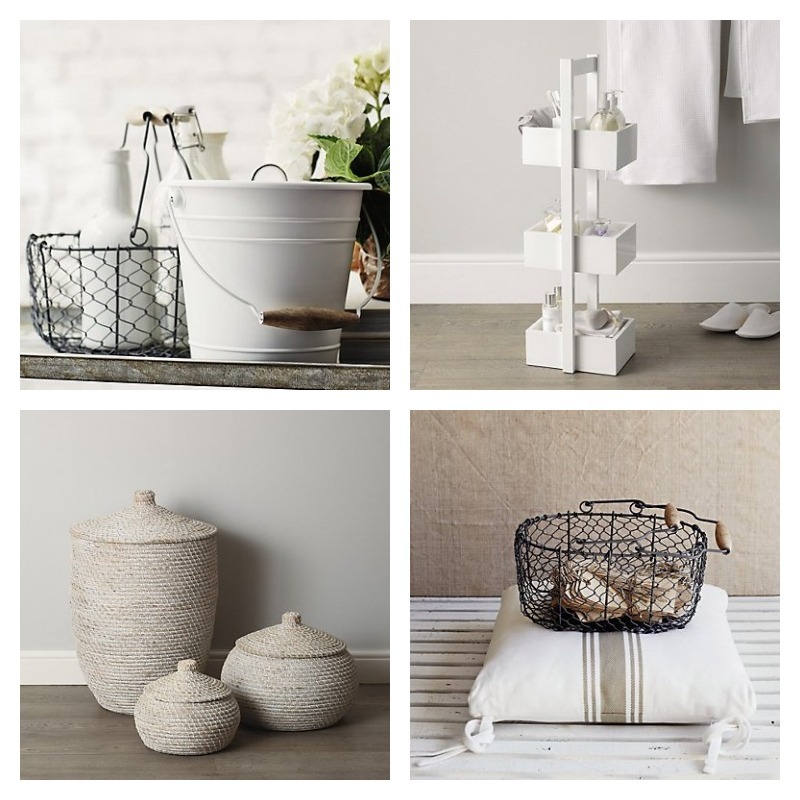 You can do so much with these fabulous four items from The White Company and they have so many new home accessories I want right now my Christmas list just keeps growing. Did I tell you I was obsessed with wire mini storage ideas too? Well, let me share you these beauties above from Wayfair, one of my favorite American companies that now is in the UK. Hurray! It’s the perfect time to come check out their mini storage solutions especially in the wire basket range. I want them all. These gorgeous wire wood baskets are perfect next to your fireplace for winter. Don’t have a wood burning stove? Fill them with pine cones, fake wood, maps, blankets, kids toys, they are multi-functional. I love the two colors it comes in too. Bring wire storage to your kitchen with this wire fruit bowl and wire bottle carrier! I have ideas for Christmas for both of these. 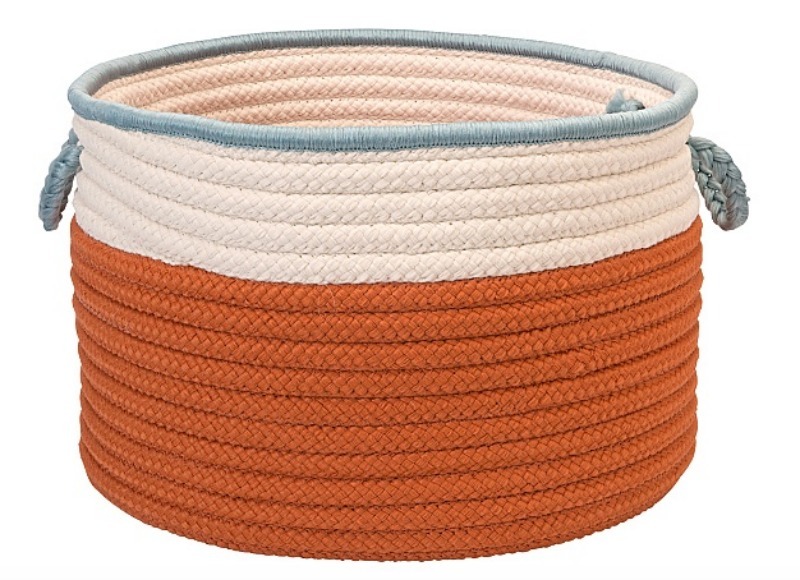 Or into the Hallway with this gorgeous wire storage basket and underneath hooks. I have had my eye on this one for a while. At great prices what is not to love. Woven baskets are just as great for storage solutions in the home. I love them full of blankets, throw pillows, or even for kids toys. We have a few similar to this one in our home and they are fantastic at holding your belongings. This In The Band Storage Bin comes in so many colors, you are really spoiled for choice. Don’t have kids you could even use it next to the fireplace to hold wood for a rustic vibe to your home decor. A home could always use organizing and with these storage ideas you can’t go wrong! Haha between our home sense, fashion sense and matching baby clothes for LL and MM we really do have similar tastes! Love it. 🙂 Great minds think alike. Love these Jenny! I’m in huge need of mini storage over here, Arthur and all his stuff is taking over the house hahah….our mini people sure do take up a lot of room!! I know the feeling that’s why I am obsessed with storage big or small to hide away all that baby and toddler stuff that seems to take over the house! lol Glad you like, thanks hunny. That’s one of my favorites for bathroom storage. I love it. So clean and sleek for all your little treasures. Thanks hun. Oh don’t go off ikea too much it’s a favorite here too. Wayfair, and the White Company are along them and even H&M have fab storage options and prices. I am a storage nut too. No you can never have too many especially with kids. Thank you and I couldn’t agree more. Storage with kids is the way forward to an organized life. Thanks hunny. Me too. I love home decor especially baskets and containers. lol Always here to help encourage shopping. Oooh I love these ideas, I love all sorts of storage stuff, especially where you can hide bits and bobs away! NO more storage is the way forward. I am the same. I am obsessed with storage, boxes, containers, etc. in my house. My hubby isn’t as big a fan. lol Thanks hun. Thanks Rebecca. I have my eye out for them on sale hopefully soon. lol They are among my favorites. Thank you Lisa. Yes they are everywhere at the moment because they now are in the UK. Very popular state side. I want so much from their site. lol I could drool all day. Always here to help encourage shopping! lol Love home decor and wire baskets are my new fave item! Thanks hunny. Lovely storage ideas. I am always trying to think of nice storage solutions, these have given me some ideas. I am currently desperate for some kind of hooks and shelf to go in the hall for the kids school bags, now they’re all at school, my hallway has been bombarded with stuff!! The wire baskets look great! I bet. I was just saying that the other day when my two start school which is soon the hallway is going to be a mess. I will have to think of hallway storage soon. 🙂 Glad to give you some ideas. Thanks for stopping by and commenting hun. We’re moving next month so I’m currently a bit obsessed with Pinterest and looking at decor ideas and storage ideas, these look fab! Some beautiful pieces and lovely ideas. Thank you so much Nicola. They have made my Christmas list that’s for sure. Nothing wrong with that Claire. I have been long obsessed with boxes and containers and lately wire basket anything as you can see. They are so trendy and efficient too. Oh I bet your kitchen looks great with your shelves. Oh I love the little mini shelves – we’ve got something similar for our bathroom and it’s brilliant for holding all the bits and bobs that usually explode at you out of cupboards! Thanks Carie. I bet they look fantastic too. Anything to keep things tidy is a win in my book. Love all these! Want want want! Thanks Izzie. No I agree and it’s great to get the ideas and wait till they go on sale. I love a good bargain!!! 🙂 Why not have the nice stuff and the cheap prices right? Thanks Becky. Yes it’s top of my xmas list. 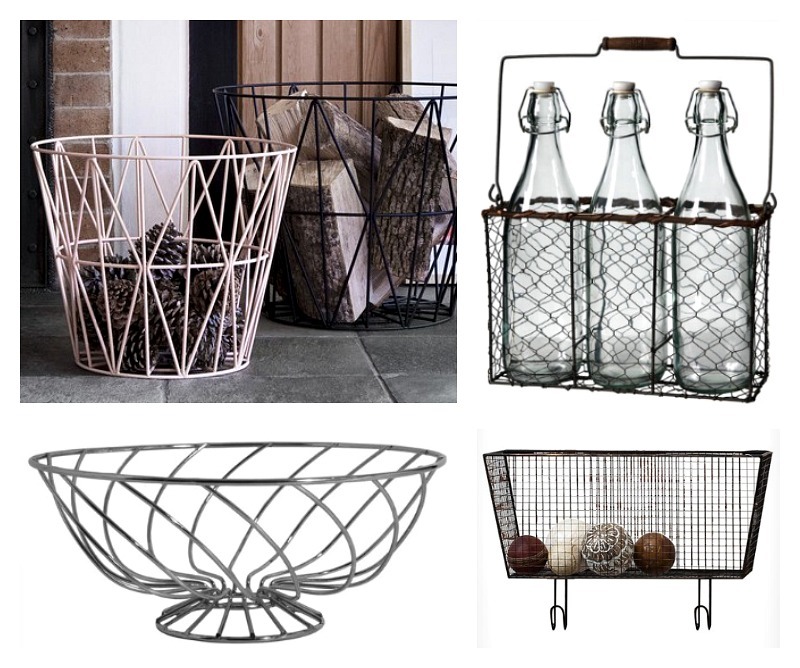 I love bottles and I love wire baskets and it would look amazing in my kitchen I think. haha Wire is great for home decor. Perfectly said Louisa, I agree. Everything should be labeled organized in pretty little boxes or trendy baskets or funky containers. lol Maybe a bit ocd but I love it all. Glad you like these. Lovely ideas, and I do like the wire storage options. You’ve got me pondering where I could put them! Ooo what fab ideas. I love your style and can’t wait for the tour-yay. Thanks Emma. I know it’s taken me a while to get the living room done mostly because I had to wait for a few things to be delivered on back order. It’s almost ready and then I will sharing away. I hope everyone likes the new look I know I do. Oh yes I caught a glimpse of a gold one there it was fantastic. I love anything wire, baskets, boxes, containers and cases. lol Thanks hunny for stopping by and commenting. Agree USA container store, Pier 1, pottery barn etc please come to the UK. Wayfair only just came to the UK so you haven’t missed out but they have AMAZING sales all the time. Keep a watch. I love their home decor. Really that’s awesome. I absolutely love Wayfair. Alot of my living room accessories are from there. Its huge in America. How very jealous to work with Wayfair! Enjoy your wall mounted basket hun. Thanks Cathie. I am the very same. The little touches is always the best part of a room. It speaks personality and finished off a room for sure. Glad you like these. Luca that is a very good idea, both eco friendly and I am sure Buba would highly agree with your decorating sense. Thanks for commenting. They are everywhere at the minute so in love with them. They help keep things contained but trendy. Oh I’m in love with wire baskets too, Jenny. I know that they’re not the most practical but they look so good. Love your style Jenny, I’m a obsessed by The White Company. I actually want to live in one of their catalogues! Everything just looks so perfect. Thanks Jen for hosting. I am a little obsessed with storage ideas! lol So glad #loveyourhome is back! Such lovely storage ideas! Great little things! I love them! Thanks for sharing! Greets, Storage Penge Ltd. Thank you. I love storage big or small for the home, office, and every day life. Something about cute little containers.